At HollowBrook Dental, we proudly use the latest and most efficient technology in the dental industry. From the latest in digital radiography to custom dental crowns made in-house by our expert lab technician, we use only the most effective equipment to achieve the best results for our patients. By implementing proven and up-to-date equipment and techniques in dentistry, we are able to detect cavities that cannot be seen on an x-ray image, perform pain-free scaling and root planing, create perfect bite impressions without filling your mouth with tasteless goop, and much more. We look forward to showing you the HollowBrook Dental technology. Call Today To Learn More About Our Technology. We care about the positive experience of our patients. At HollowBrook we use digital X-rays for our patients. Use of digital X-rays significantly reduces exposure to radiation and creates images instantly allowing us to provide immediate feedback to our patients. Beginning with our panoramic dental X-rays, we create a single image of your entire mouth. This X-ray includes the upper and lower jaws, temporomandibular (TMJ) joints, each tooth and your nasal area and sinuses. This provides us with a flat representation of your jaw’s structure, allowing easy analysis of each part. The old way of taking X-rays means placing a piece of uncomfortable plastic inside your mouth and biting down on the left, right and front of your mouth. Digital X-ray sensors are small, soft flexible sensors that you bite in the same way but with more comfort. This reduces the potential for needing to retake images due to movement caused by patient discomfort. At HollowBrook Dental, we understand that seeing is believing. We could tell you in full detail about all of the issues affecting your dental and oral health, but wouldn’t it be better to see for yourself? Intraoral cameras give us a clear, up-close look at your teeth and allow us to share that view with you using our in-office displays. With these tiny cameras, we easily snap digital images that are perfectly light and clear, showing tooth decay, damage, gum disease, and other oral issues. By getting a closer look instantaneously with an intraoral camera, we can give you a more accurate diagnosis and a better understanding of what’s going on inside your mouth. HollowBrook Dental is the only dental practice in Colorado Springs with its very own lab for crown and bridge fabrications. Our full-service laboratory is equipped with all of the latest technology to create gorgeous, highly functional E4D dental crowns. Our full-time lab technician is incredibly skilled and at our office daily to create custom dental crowns for you. That means, when you visit HollowBrook Dental, we can prepare your teeth for dental crowns and then place your permanent crowns, all in the same day. By maintaining an in-house lab, we eliminate the need for temporary crowns and multiple visits. In addition to radiography, we also offer computerized tomography with our I-CAT FLX cone beam unit. 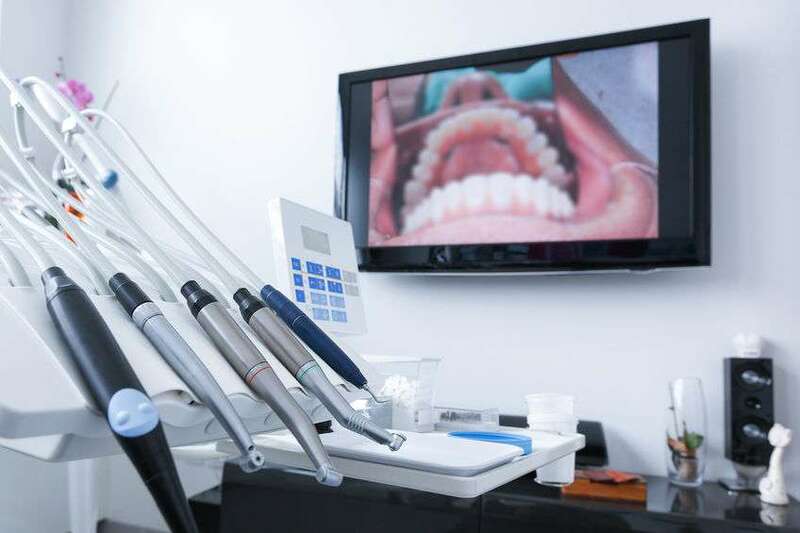 This allows us to create a three-dimensional image of your teeth, gums, jawbone, and oral cavity to better see what’s happening in your mouth and what’s affecting your oral health. Sometimes two-dimensional x-rays don’t provide enough information about a patient’s condition. Instead of sending our patients out to specialists for CAT scans or other 3D imaging, we use the I-CAT FLX to perform necessary diagnostics in one visit without additional appointments or referrals. Hard and soft tissues respond differently to lasers. When reshaping gum tissue, a diode soft tissue laser is traditionally used, while a different type of laser is used to perform procedures on enamel and bone. At HollowBrook Dental, we use a dual-wave therapeutic laser that can be tuned to work with either soft or hard tissue for fast, painless procedures that yield the most beautiful results. Instead of scraping away at your teeth endlessly with a manual scaling device, we use our dual-wave therapeutic laser to eliminate plaque and tartar. When you think of getting a cavity filled, you probably think of one or more very uncomfortable injections to numb the pain. Then, though the affected area is numb, you think of the irritating sound of the drill and the way it sets your teeth on edge. Well, it doesn’t and shouldn’t have to be that way. Thanks to the Biolase MD water laser, we can actually drill and fill cavities without anesthetic, and the whole process is completely painless. Drilling into a tooth creates friction and heat, which trigger pain. With the advanced technology of the Biolase MD water laser, we can actually treat the affected tooth without creating any heat or friction. It’s painless, fast, and accurate. In recent years, a lot of studies have shown that lasers can be incredibly effective as antibacterial and antimicrobial tools. The Beamer diode antibacterial laser we use at our practice in Colorado Springs is known for its versatility and effectiveness in periodontal and endodontic procedures, and it is highly effective at ridding teeth of harmful bacteria that can cause tooth decay and gum disease. By using a diode laser, we are able to perform restorative and cosmetic dental procedures in the most comfortable way possible, with the very finest results. If you need a dental crown or a bridge, you may be expecting a long and involved process of biting down on a goopy substance to get several bite impressions to be sent off to a lab. Well, not only do we create our crowns and bridges at our in-house lab for same-day service to our patients, but we also eliminate the need for any goop or powder when taking impressions. Instead of taking manual impressions with the goop or dusting your teeth with powder for an optical digital impression, we use laser technology to take an accurate impression with the least amount of discomfort and no goop. Treating periodontitis has never been gentler, faster, or more effective. At HollowBrook Dental, we use EMS periodontal scaling devices to clean away plaque, calculus (tartar), and stains from the surfaces of your teeth, the gum line, and under the gum line along the roots. These devices use ultrasonic technology to blast away bacteria and calculus faster than traditional methods and without all of the scraping and poking that patients dread. Periodontitis is a serious condition, but with the help of our EMS periodontal scaling devices, we can make treatment a breeze for our Colorado Springs patients. If you’ve gone through the process of straightening your teeth with Invisalign® trays, you most definitely want to keep your teeth as straight and gorgeous as they were the day you took out your last trays. Thanks to our Bio-Star thermoplastic forming machine, we offer our patients retainers that fit perfectly to their teeth. After taking a digital impression of your teeth, it takes our incredibly skilled lab technician only a few minutes to use the Bio-Star thermoplastic forming machine to make a customized retainer that you can comfortably wear while you sleep soundly at night to keep your teeth in perfect alignment. While doctors and researchers are still not exactly sure what causes temporomandibular joint disorder (more often called TMD or TMJ), we do know that it is greatly affected by the tension patients carry in their jaw joints. We can accurately measure this tension and the balance between one side of the jaw joint and the other through the use of a joint vibration analysis device and its corresponding interpretation software. If you believe that you have TMD, we can help you by performing tests with this device and analyzing the results. This helps us determine the proper course of action to relieve your pain and keep your teeth healthy. For more information on joint vibration analysis and TMJ/TMD, we offer solutions through our sister company, HollowBrook Sleep. Reach out for your free consultation. It’s a slight understatement to say we care about technology at HollowBrook Dental- we love it. Through experience and patient feedback, we understand how it saves time for patients and ads extra ease to their visit. The iTero scanner provides 3-D visualizations of your mouth and teeth so we can show you exactly what we are seeing. To capture your 3-D scan, we use a small wand and scan each and every area and have a full scan complete it under 3-minutes. iTero Scanner seamlessly places images together in the correct order and adjusts to changes in positioning as we adjust or shift our position. We keep 3-D scans on file for easy, future reference.